If you follow the blog, you know that we recently took a trip to New Orleans. We had a great time eating our way through the city! I bought a ton of spices and couldn't wait to start using them. The first thing I made was this Cajun Mac and Cheese. This was so delicious! 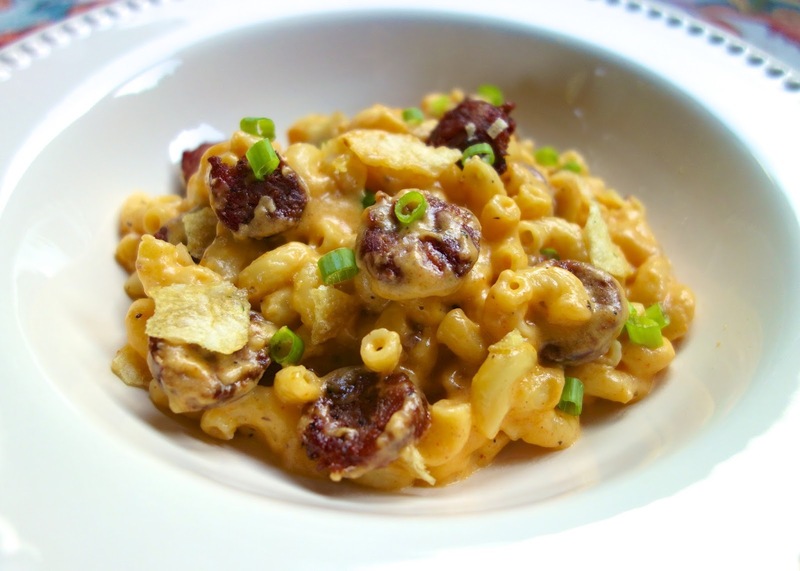 It is packed full of flavor from the cajun spices and andouille sausage. I topped the mac and cheese with some green onions and Zapp potato chips! Comfort food at its best!! I made this Cajun Mac and Cheese in the new Calphalon Elite Nonstick 3-Piece Fry Pan and Sauté Pan Set from Williams-Sonoma. I received a 3 piece set from Calphalon to review, and I loved it. The most amazing thing about these pans is that you can use metal cooking tools in these nonstick pans and it won't hurt the nonstick surface. I had to test out their claim, so I used a metal whisk to make the cheese sauce. Nothing happened to the pan! Amazing! The pans are also dishwasher safe, which is a must at our house. Calphalon is going to give one lucky Plain Chicken reader a chance to win a 10-inch Calphalon Elite Nonstick Fry Pan! I've been using the skillets for a month and I can truly say they are fantastic! Use the rafflecopter widget below the recipe to enter! 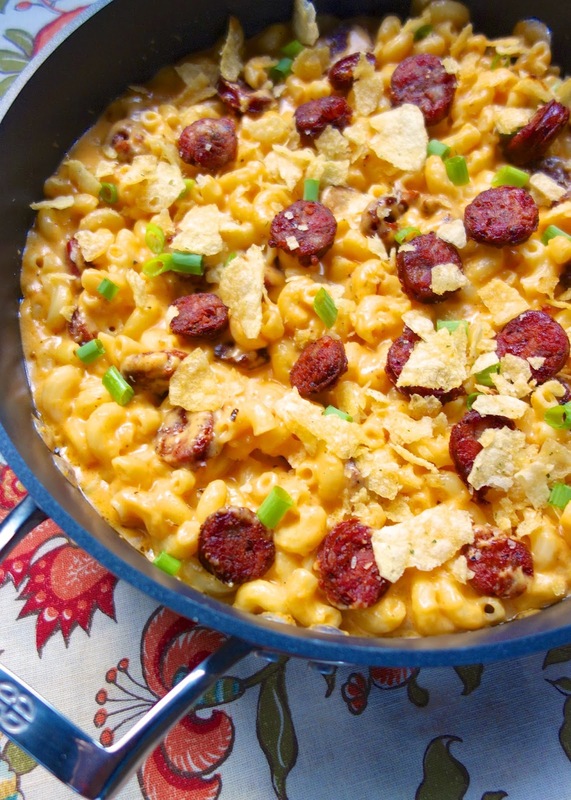 Cook andouille sausage in a 10-inch skillet until brown. Remove sausage from skillet. Reserve 2 Tablespoons of fat and discard the rest. Add flour to fat in the skillet and cook for about 2 minutes, until roux is light brown. Slowly whisk in milk and cajun seasoning and continue whisking until the sauce is thick and smooth, about 5 more minutes. Add the pasta and cheese to the skillet. Reduce the heat to medium low and cook, tossing to coat the pasta in the sauce and melt the cheese, about 1 minute. Top pasta with sliced scallions and crushed chips. Hi Steph, question#1 of the rafflecopter doesn't have what you should do. Cindy - just click Enter for a chance to win. You don't have to do anything. Amy - it was divine! Hope you enjoy it! I love this recipe! And I would love to win me some Calphalon. I love their cookware. This looks amazing and so simple for busy week nights!! The handle design on these pans looks like it will be good for my bad wrist!!! That is some great sounding M&C - we are Calphalon fans. I can make this now since I have the seasonings :) Can't wait to try it and thank for another great giveaway! Ashley - yes you can! I used the Joe's seasoning in this and it was great! 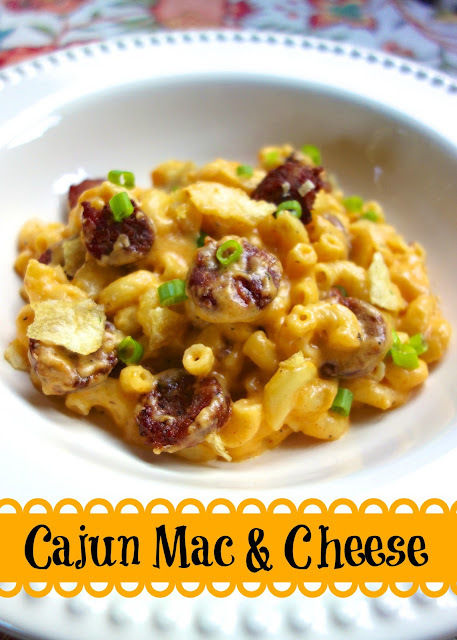 I use cajun seasoning on fried chicken and hamburgers and love it, so this sounds really good! This would be a huge hit at my house! Especially with the sausage--yum!